Yay! The 2015 Totally Useless Stitch-A-Long is once again underway thanks to Sharon at It's Daffy Cat. What is the Totally Useless Stitch-A-Long aka TUSAL, you ask. 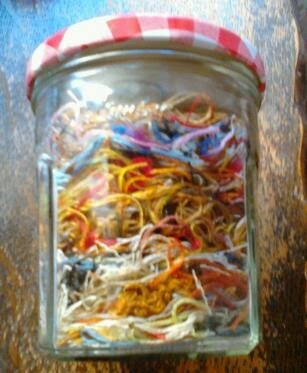 Basically, you'll save your orts (that piece of floss you're left with when you're done stitching that's too short to do anything with) in a jar, and every time there is full moon, you'll post a photo of the jar on your blog. More info here. Thank you, Sharon,for hosting the TUSAL once again! I believe there was only ONE year where I actually posted a picture of my jar every time there was a full moon. 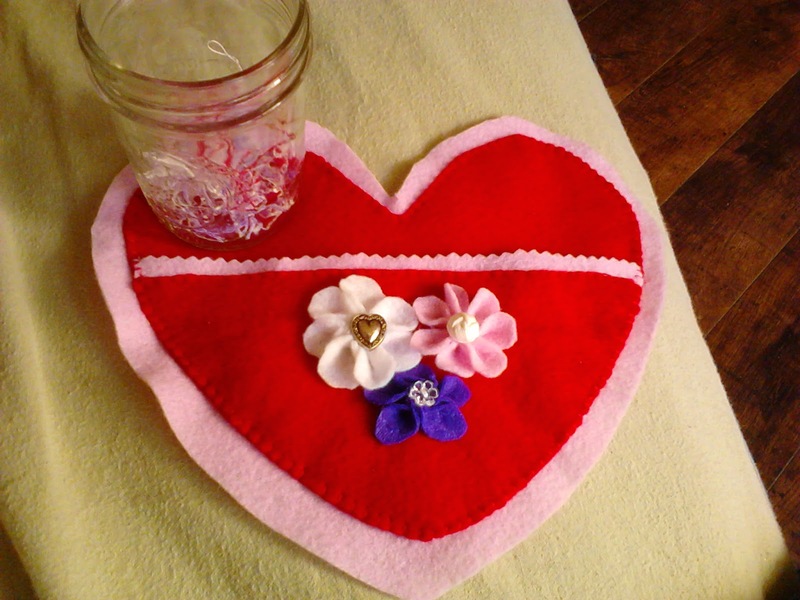 In 2014, I posted pics of my orts jar three times. I'm shooting for four times in 2015. Go, me! Really, I'm hoping the TUSAL will get me to not only blog more often but also make more stuff this year. This was my jar at the end of 2014. 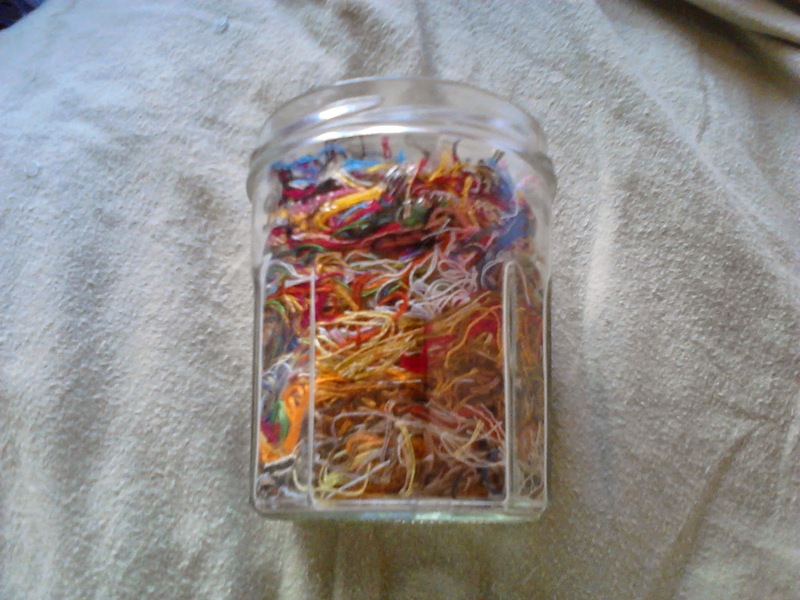 Those are threads from the past few years. I'm starting with a new jar for 2015. Edited to add: I have no idea why some of this post is highlighted in white. I did not do that. Also, I can't get the font to change. Glad to see you're still blogging! I'm trying to update and get back in a blogging routine. They've changed so much I am having a hard time, and it seems iPad isnt the best way to update. Where do I put my pictures so I can put them on my blog? Thanks for visiting my blog! I think everybody should adopt a dog or three. 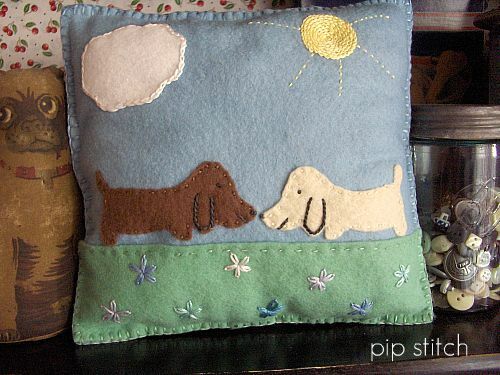 I love aprons, needlework and things made out of felt. I'm a sucker for the word "vintage." I want to marry my iPod. When I'm employed, I work with preschoolers. That's about it.